"One of the best books about African dwarf frogs I have ever read. I feel confident I want to get a dwarf frog for my son now because I know how to properly care for one. I enjoyed reading it, and it was nice that all of my questions about how to buy and care for a dwarf frog were answered so clearly and concisely in the book." "This book covers what I needed to know about how to buy a healthy dwarf frog for my kids. I now know exactly what a dwarf frog needs for food, what to buy for a tank, and healthy frog care too. I liked the simple instructions that were easy to read and easy to remember." If you or your child are passionate about having a pet and are looking for a friendly, low cost and incredibly easy-to-care-for pet, then adopt a few -- African dwarf frogs! African dwarf frogs are not your average pet – they live their entire lives under water ( they sometimes come up to breath) and they are incredibly entertaining to keep. These little frogs will delight and amaze you by dartling around the tank and floating on one leg. With African dwarf frogs you never know what you are going to see next! These little frogs take very little room so they can fit into even apartment style living, and can live in a small aquarium tank right in your child's room! Are you concerned about keeping an aquarium pet? If you have never kept aquarium fish or aquatic frogs before, don’t worry. African dwarf frogs are hardy creatures and they can withstand a variety of tank conditions which makes them really easy to keep because they are more tolerant to adverse conditions than most fish are. This leaves you a little extra room for error as you and your child learn how to take care of your dwarf frog. It won’t be long before you realize that keeping a tank full of frogs is easier than you thought it would be and more fun too! Owning and raising dwarf frogs is fun! Many people recall vivid childhood memories of trips to ponds and other swampy places were frogs and dragon flies lived. You may have had fun trying to catch a leaping leopard frog and enjoyed catching them and releasing them as a child. With that thought in mind, wouldn't it be great to get an inexpensive and easy to care for pet for your child? African dwarf frogs are much smaller than leopard frogs. These frogs are very small and typically grow to a maximum length around 2.5 inches. The majority of this length can be attributed to the long, thin legs African dwarf frogs use to propel themselves through the water. African dwarf frogs are a species of freshwater aquatic frog belonging to the family Pipidae, and are primitive, tongueless frogs that are typically found in the tropical regions of South America and the sub-Saharan regions of Africa. These aquatic frogs have slim, almost flat bodies that range in color from brown to olive green and they often exhibit dark spotting along their backs and legs. African dwarf frogs have lungs like mammals rather than gills like fish, despite being aquatic creatures so you may occasionally see them dartling to the surface of the tank and taking gulps of air. African dwarf frogs enjoy human company and they will interact with the people who care for them. African dwarf frogs enjoy being handled and held and are actually a very companionable frog and fun for kids as well as adults. They are a great first pet for you to buy for your child and don't require the expensive food, upkeep and vet costs, or walking or letting out that a cat or a dog would. So for a first pet or if you need a pet for a small home or apartment or one the child wants to keep in their room, they make an excellent choice. Raising African dwarf frogs can be a simple choice because the tiny African dwarf frogs can be the first step to showing your child how to be responsible for a pet. You know from past experience the joy of caring for a pet and the love that having a pet of your own means to you. Let you child feel the pride of caring for, feeding, and cleaning the aquarium and watching their own frog's antics. All these can be very rewarding tasks! Your child will love having a pet -- and will always remember good times they had when they are older because of their memories of their first dwarf frog. So wondering how you get started? If you already have a freshwater fish tank set up you can add a few frogs to your already existing tank without having to make any changes at all. I even include in my ebook what types of fish do well with your African dwarf frog and what fish do not and why so you can avoid any problems with your aquarium. If you are completely new to the aquarium hobby, getting started with a dwarf frogs is easy – all you need is an aquarium starter kit and a few frogs and this book, and you will be ready to go! I want to help you to take your first step towards owning your first dwarf frog. When I was looking to purchase my own African dwarf frogs many years ago; I discovered there was very limited information available for help purchasing, owning, feeding, raising African dwarf frogs. After searching for many hours for dwarf frog information, as well as talking to dwarf frog fanciers I finally decided that there was a definite need for a comprehensive book all about African dwarf frogs from A to Z. With that thought in mind, I created this book, called "African Dwarf Frogs Complete Owner's Guide". Everything you want to know about buying, feeding, caring for, raising and keeping your African dwarf frogs healthy and much more! This book is guaranteed to answer all of your questions about African dwarf frogs even including tips on diseases and health care. 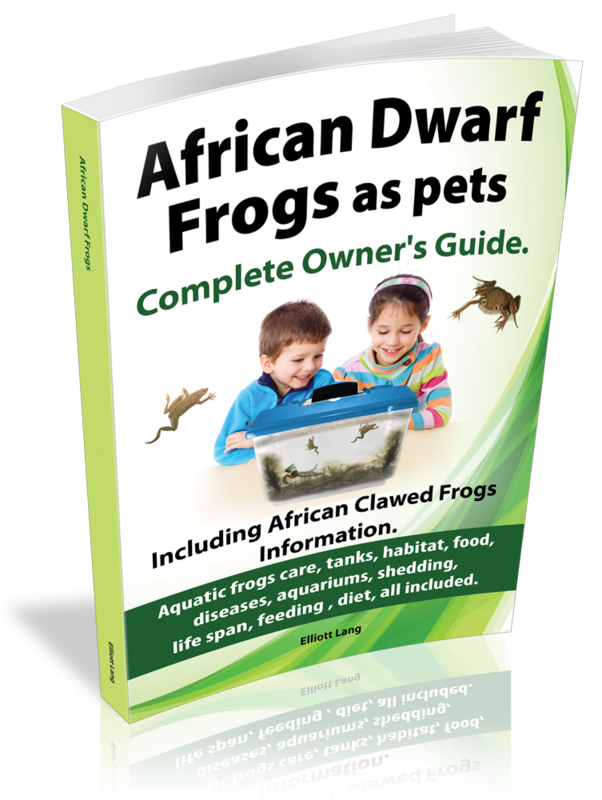 Anyone who is passionate about owning, keeping raising African dwarf frogs will be very pleased at the comprehensive content included in this guide. You get step by step instructions on how to keep African dwarf frogs based on years of experience of my own keeping African dwarf frogs. The guide is an easy read and is packed with useful hints and tips. In a straightforward, no nonsense fashion, I cover all aspects of keeping African dwarf frogs – including handling, the different types and species, frog feeding, care, diseases, aquariums, and shedding -- you get everything you need to know to keep healthy and beautiful African dwarf frogs! Common questions people have about African dwarf frogs and keeping them. Do African dwarf frogs make good pets? Yes, they do! Can African dwarf frogs live in a standard fish aquarium? If I want to buy a tank, is glass, plastic or a nano tank best? What type of tank heater, and filter are best and why? What size aquarium do I need and how much space is needed per frog? Can I mix male and female frogs together? What happens if I do? 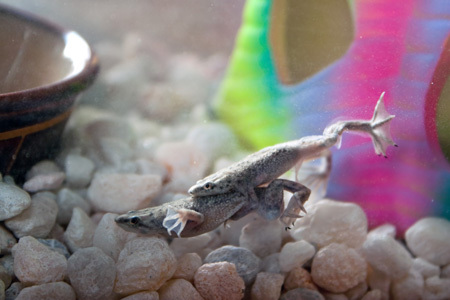 How do I tell a male from a female dwarf frog? Do I need to get a permit to own African dwarf frogs? If so, how do I get one? I heard dwarf frogs are social creatures. Do I need to buy more than one? How many should I have? What is the best type of dwarf frog to buy and why? Should I buy an African dwarf frog or an African clawed frog? What's the difference and how do I tell? How to choose a dwarf frog and where to buy them. Read all about this in the book. 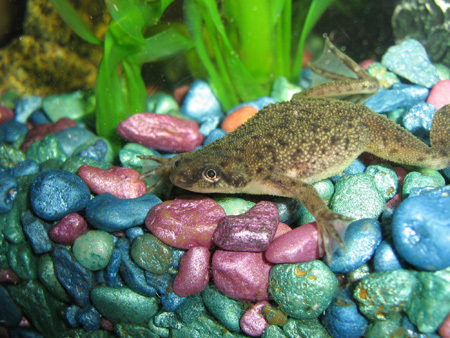 How do I know if a pet store or a breeder of African dwarf frogs or African clawed frogs is selling me a healthy frog? What do I watch out for? I read I can buy a complete dwarf frog kit online? Is this a good thing to do? What can I add for tank decorations inside my tank? What is good to use? What do I need to be careful of not to use? Where should I locate my frog's tank? Does adding a light matter to the frog? How long should a light be on per day and why? What type of sounds does my dwarf frog make and why? How do my dwarf frogs breed and make babies? How do they lay eggs and hatch as tadpoles? What type of care do I need to give them? How dwarf frogs have babies, and how to keep baby tadpoles safe and why. Find out how to socialize your dwarf frog and what your frog likes to be happy. How often do I need to clean the tank and clean the filter? What type of filters and how often should I replace them? The many benefits of owning a dwarf frog include: they are quiet, easy-to-care-for, inexpensive to feed and will entertain you with their antics! Stop wasting your time and patience trying to get this critical dwarf frog information by surfing the web. Your time is more valuable spent elsewhere! Not to mention the frustration of banging your head against the wall when you run into problems with your African dwarf frogs when they are sick or stressed by improper care, because by then it is too late! Normally to be able to talk to a dwarf frog pet seller and invest their time in your dwarf frog program could cost you hundreds of dollars. But I’m not going to charge you anywhere near $100 and not even $80 either to get your hands on the simple to follow book on "African Dwarf Frogs - Complete Owner's Guide." With this simple to understand, and comprehensive African Dwarf Frog Owner's Guide, there's no stopping you now from indulging in your frog fancier thrill by getting your first African dwarf frogs! So what’s the catch? Why am I practically giving this very informative guide away that took months of my time to create? We’ll it’s really quite simple. I want to give everyone, including you, who need the ability to utilize the book, "African Dwarf Frogs - Complete Owner's Guide" to your fullest advantage. You can enjoy owning and taking good care of your African dwarf frogs and I'll show you everything you need to know! If for any reason you truly believe that this product doesn't help you in keeping your African dwarf frogs, ask for a refund within the next 60 days. No question asked and no hard feelings. We'll refund you the FULL price of what you paid for. It's that simple! That means you can try out "African Dwarf Frogs - Complete Owner's Guide" at my risk. But don't take it only from me that is book is a great reference for a dwarf frog lover, here are what other happy dwarf frog owners said after they purchased the book. "Great dwarf frog book that delivers what it says it will. I know I will refer to in when taking care of my little frogs friends in the years to come!" "I wanted to raise dwarf frogs for fun with my kids. This book helped me select healthy frogs at my local pet store. 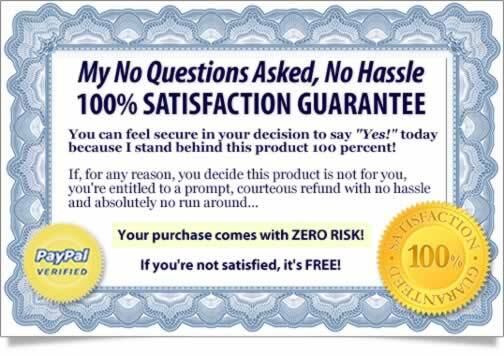 This is easier than I thought it would be and much cheaper and less work than trying to keep a cat or dog." "My children love to watch the frogs swim around and they do funny things when they eat their food. They are every inexpensive to raise and the book helped me know exactly the right thing to feed them and care of them." I love owning my little dwarf frogs. It is a great hobby that now I am really enjoying sharing with my grandkids and even the neighbor kids! This book is what got me started!" I'm sure you'll be able to easily see how easily this comprehensive book will benefit your dwarf frog keeping in no time at all. I wouldn’t have spent the time and effort creating "African Dwarf Frogs - Complete Owner's Guide" and writing this letter to you if I didn’t think it would certainly help you enjoy getting your first African dwarf frogs! Click on "add to cart" button below to get INSTANT ACCESS to "African Dwarf Frogs - Complete Owner's Guide" and get the ebook via instant download just like I promised you for the small investment of only $19.97, (approx. £12.47, Euro 15.44). That is a drop in the bucket versus the time you would spend trying to find all this key dwarf frog keeping information. Are you excited about getting your own African dwarf frogs? You should be! Now with the help of my guide you can go and buy your African dwarf frogs and take care of them with confidence! Get ready to enjoy keeping your own African dwarf frogs! Get "African Dwarf Frogs - Complete Owner's Guide" and you'll know things other dwarf frog fanciers don't! This book will provide you with all the essential information you need to get started in keeping African dwarf frogs. Soon you will know everything from the basics of buying your dwarf frogs, tank set-up, feeding and maintenance to proper health care, so by the time you finish this book you will be fully equipped with the knowledge you need to be successful. You may even be so excited that you go out the same day to purchase your African dwarf frogs! P.S: Once you order the book you will quickly see how fun and profitable raising African dwarf frogs can be. Get your copy of "African Dwarf Frogs - Complete Owner's Guide" right now. Elliott Lang is a pen name.